The cover image shows the artwork “Birds” by artist Lauren Silberman. Political tumult and provocative art have a symbiotic relationship that is being rekindled in the wake of Donald Trump’s presidential victory. Before the Republican even takes office January 20, a new movement of protest art among women is beginning to emerge. 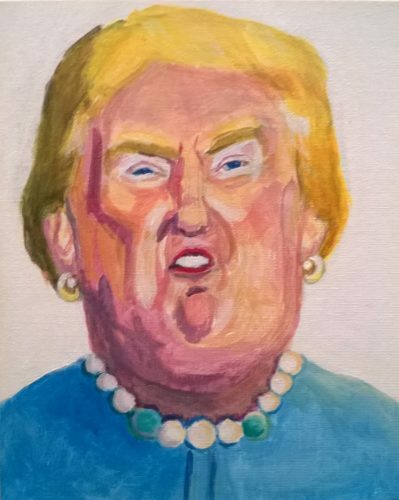 The artwork “nasty woman” by artist Naoko Tadotsu was displayed at the “Nasty Women” art exhibition in Queens, New York on Jan. 12, 2016. On Thursday night, the first of 30 “Nasty Women” art exhibitions opened in the cavernous Knockdown Center in Queens with more than 700 female artists’ work hung on 12-foot-tall block letters spelling out N-A-S-T-Y W-O-M-E-N. A Trump voodoo doll, a painting of flaming high heels, a bracelet etched with “UNGRABBABLE,” a photo of well-manicured middle-fingers, and innumerable depictions of vaginas were on display and all for sale for $100 or less. 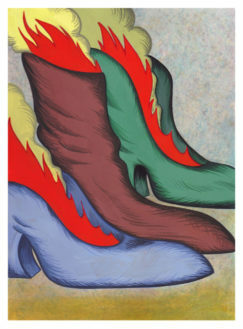 The artwork “Hot Heels” by artist Julie Curtiss was displayed at the “Nasty Women” art exhibition in Queens, New York on Jan. 12, 2016. Organizers said more than 2,200 people attended the show’s opening night (it runs through Sunday) and they spent $34,950 on the art, all of which was donated to Planned Parenthood, the largest provider of reproductive health services in the United States. The show wasn’t inevitable — it came as a reaction to the unforeseen turn of events in American politics. Notably, many of the artists, organizers, and attendees said it likely would not have happened if Hillary Clinton had won the presidency. “I wouldn’t be organizing if Hillary won,” said Fiore. “It got me fired up and got me to use my skills actively.” Carly Russell, a 24 year-old calligrapher in Washington Heights, made her hand-lettered “Pantsuit Nation” pins only after Clinton’s defeat. “Art is my weapon of choice in this fight,” she writes on the packaging of her pins. Pins reading “Pantsuit Nation” were given to attendees of the “Nasty Women” art exhibition in Queens, New York on Jan. 12, 2016. Photo by Alex Thompson . Organizers hope that although the first woman nominee of a major political party wasn’t successful, the backlash to Trump may allow them to move feminism forward anyway. The artwork “Trump Voodoo” by artist Sandra Koponen was displayed at the “Nasty Women” art exhibition in Queens, New York on Jan. 12, 2016. It’s not just that Clinton lost, people at the show explained, but that a man like Trump won; a man that called his opponent a “nasty woman” when she criticized him and who boasted behind closed doors that he could sexually assault women because he was a celebrity. Nor would an ordinary Republican have provoked the wave of protest art to come, they said. The exhibition started simply enough with an impulsive Facebook post from Fiore’s friend, artist Roxanne Jackson, a week after Trump’s victory asking if anyone would be interested in a group show of female artists. The artwork “Gold and Blond” by artist Brandi Twilley Gold was displayed at the “Nasty Women” art exhibition in Queens, New York on Jan. 12, 2016. What Jackson expected to be a small-ish local show has in just over a month become a national political art franchise with 29 more shows confirmed in the coming months throughout the United States — including in red-state cities like Omaha, Lexington, and Charleston — and internationally with shows scheduled in Australia, the UK, Belgium, and the Netherlands. The response was so overwhelming that the organizers had to stop accepting submissions for the New York show at 700. The artwork “A good man is hard to find” by artist Courtney Andrews was displayed at the “Nasty Women” art exhibition in Queens, New York on Jan. 12, 2016. “Art in itself has the potential to be an act of protest,” said Jackson, who co-directed the exhibit. “It can object and be transgressive to the status quo.” Jackson said the exhibitions can focus grassroots rage into something politically significant, and she hopes more people will begin experimenting. “We need to get organized like the tea party did and we can create new forms of protest,” she said. The artwork “Malos Ojos” by artist Kaylee Koss was displayed at the “Nasty Women” art exhibition in Queens, New York on Jan. 12, 2016. The tea party empowered some of the most ideologically extreme elements of the Republican Party; a liberal tea party runs the risk of doing the same and further alienating the left from moderate voters. Allie Hoffman, a 33-year-old attending the show, worried that Nasty Women events might reinforce liberal groupthink. “I’m wondering if this is reaching Indianapolis,” she said.